Did Air India Buy Paintings From Former Defence Minister’s Wife For Rs 28 Crore? 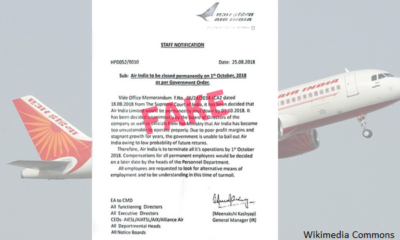 An RTI reply does not support journalist Abhijit Majumder’s claim that Air India paid 28 crore rupees to AK Antony’s wife for eight paintings. Did ailing national carrier Air India in 2011 pay Rs. 28 crore to Elizabeth Antony, wife of former Defence Minister AK Antony? 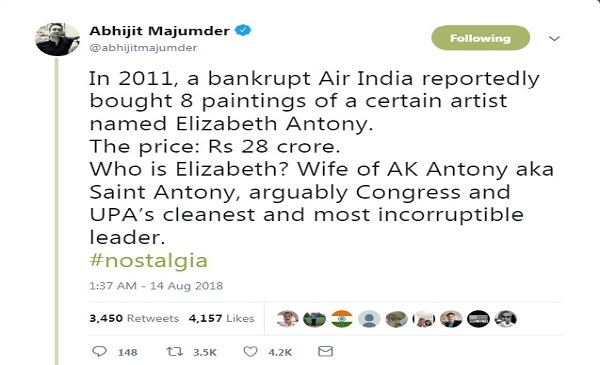 Abhijit Majumder, editor of Asianet News Network owned digital news website MyNation.com, on August 14 tweeted that in 2011 Air India purchased 8 paintings for Rs 28 crore from Elizabeth Antony. 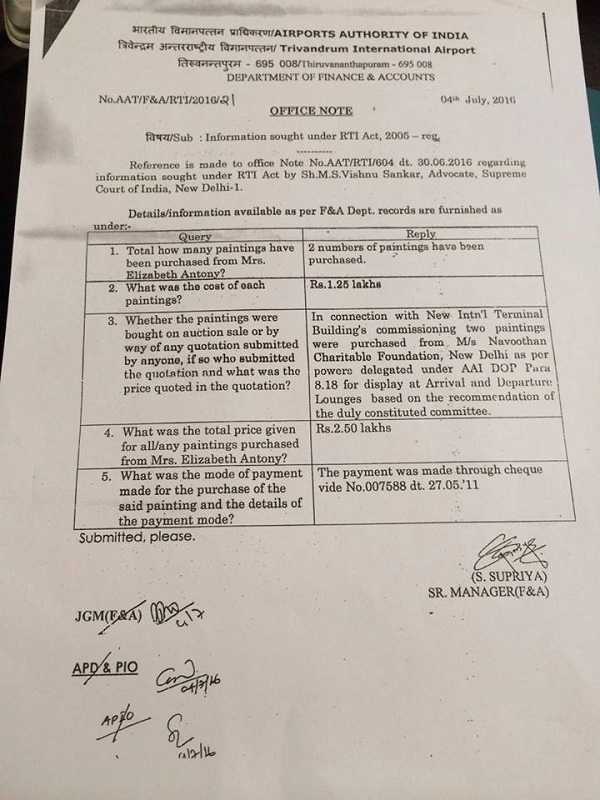 In 2011, a bankrupt Air India reportedly bought 8 paintings of a certain artist named Elizabeth Antony. The price: Rs 28 crore. His tweet got over 4000 Likes and over 3,400 retweets at the time of writing this story. 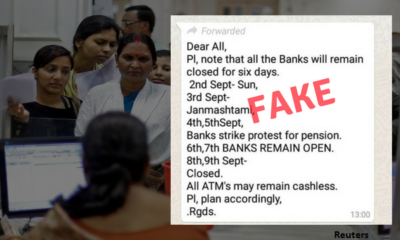 It also attracted nearly 150 replies many of which called it false citing a news article about a Right To Information (RTI) reply that contradicted the claim. The issue, which created a stir six years ago, was dredged up this year in late July by a few Twitter users. 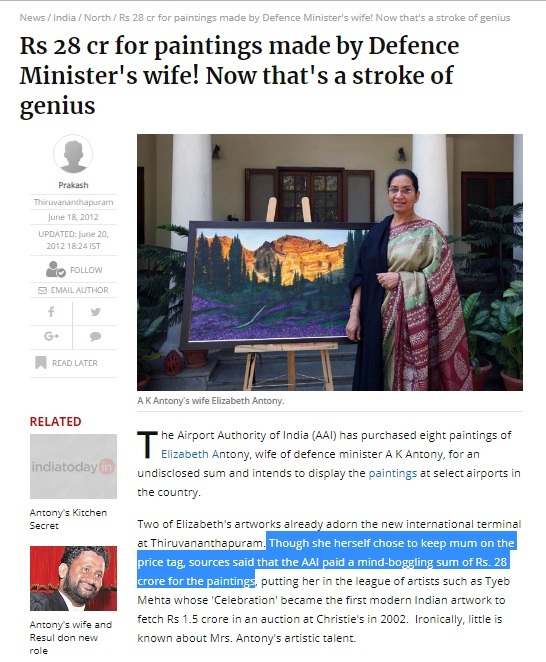 It was Abhijit Majumder’s former employer the India Today Group that first reported Elizabeth Antony sold her paintings to Air India and Airports Authority of India (AAI), respectively, through two separate stories published by India Today in 2011 and Mail Today in 2012. Majumder was the managing editor of the newspaper Mail Today before exiting earlier this year. Elizabeth Antony, a retired former banking professional, turned to painting landscapes to raise funds for her NGO, Navoothan Charitable Foundation, which helps women taking care of family members suffering from cancer. Her husband AK Antony served as the defence minister from 2006 to 2014. In June 2012, Mail Today reported that Airports Authority of India bought eight paintings from Elizabeth Antony for an undisclosed sum. The article cited sources to claim that the paintings were bought at 28 crore rupees. Mail Today’s story is no longer accessible online and was last visible on August 13, 2018. A spokesman for Air India and the chairman of Airports Authority of India declined to comment when contacted by BOOM. 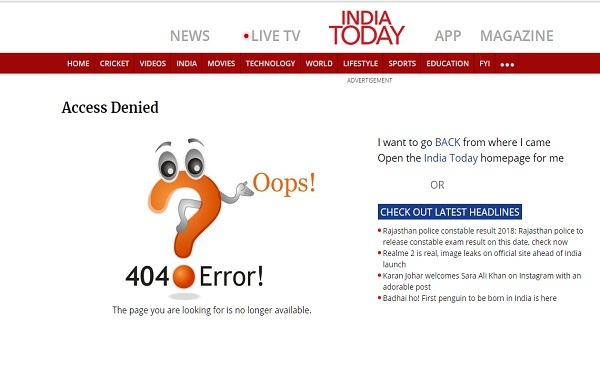 Emails sent to India Today and Mail Today went unanswered at the time of publishing this story. BOOM also contacted Elizabeth Antony who was surprised to learn that the issue has resurfaced. “One of my team members filed an RTI at the time when the rumours started. The RTI was replied to by the Airports Authority of India who even mentioned the cost of the paintings in their reply,” Antony told BOOM. 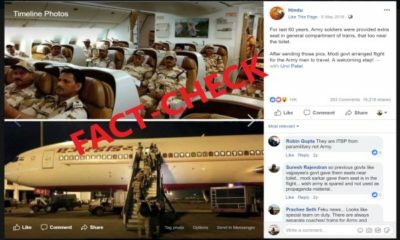 In 2016 a Facebook page managed by Elizabeth Antony’s staff posted a reply from Airports Authority of India to a RTI query raised by Supreme Court Advocate MS Vishnu Sankar. Antony had also refuted the allegation in 2012. The RTI reply date July 4, 2016 from Trivandrum International Airport stated that two paintings were purchased from Antony’s Navoothan Charitable Foundation for Rs. 1.25 lakh each to display in the departure and arrival lounges of the new international terminal building. The RTI response was reported by Deccan Chronicle in its story RTI clean chit to A K Antony’s wife on August 19, 2016. As the government looks for a buyer for the debt-ridden airline, Air India’s art collection curated over the years since its hey days could fetch a neat sum. But neglect of artworks, paintings lent to executives to display in their homes and forgotten and absence of meticulous records make it difficult to put a value on what is thought to be a formidable modern art collection.